☞ Apple co-founder Steve Jobs is generally acknowledged as a great storyteller. During his exile at Pixar Animation Studios, after he was banished from the Apple kingdom, he was undoubtedly involved more directly with storytelling. 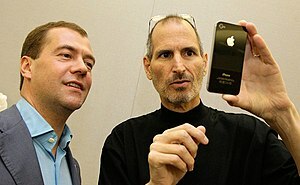 But his stint as a storyteller didn’t end there, as could be seen in his phenomenally successful second coming at Apple. What he did is now the subject of case studies in marketing textbooks, which may include the role that narrative plays in his salesmanship. “That’s right, the late, great Steve Jobs wasn’t just a tech visionary. The temperamental former hippie was also a master raconteur who understood the power of a well-told story. From his legendary product launches (in which he took us on winding journeys of anticipation, intrigue and revelation) to the Stanford commencement speech he gave in 2005, Jobs was a master of the storytelling art – and perhaps one of the best storytellers the corporate arena has ever known. His ability to weave a narrative may not be the only reason Apple is the world’s most valuable company* (there are many ingredients to that particular cocktail of success), or why you can’t go five metres without seeing an iDevice in someone’s pocket and why, upon hearing news of his death, the President of the free world, Barack Obama, said Jobs “changed the way each of us see the world”: but it certainly helped. * Exxon Mobil has apparently regained its lead, but Apple is still in the top rank of valuable companies in the world. Sunday Comics: What Would Steve Jobs Do?